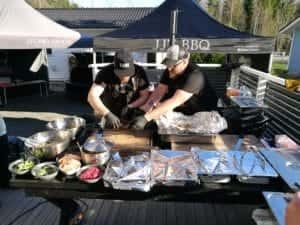 This year JJ’s BBQ Camp took place again in Salo, Finland, on 5th and 6th of May. I participated the Camp last year for the first time and it was so much fun I wanted to repeat the experience. This time I was especially keen on hearing travel stories from JJ. He was touring Texas earlier this year and visited 25 BBQ joints in two weeks. Must have been one great journey. Main theme for the camp was again low and slow. We kicked off on Saturday at 5:30am by setting up JJ’s BBQ Smoker Grande. That is large reverse flow offset smoker built on trailer. 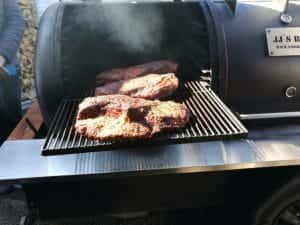 At 6:30am we were ready to put three 20lb (9kg) Black Angus briskets in and then continued preparing some breakfast. After light breakfast, we started rubbing five 5lbs (2,2kg) pork shoulders. Each one of them got different kind of rub on. While part of the team worked on pork shoulders, some of us started slicing Picanha for skewers. At the same time, we got presentation on how to make Chimichurri. This is great sauce for Picanha! Once pork shoulders were put into large smoker, we grilled Picanhas on charcoal grill and ate them for lunch. Afternoon we got great presentation from Ferenc “Feri” Vilisics from Feri’s Sausages. Feri lives in Helsinki but is originally from Hungary. What a great spices and herbs he had! 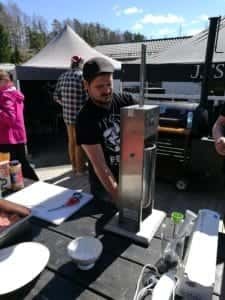 He walked us through the sausage making process and demonstrated how to use manual sausage stuffer. 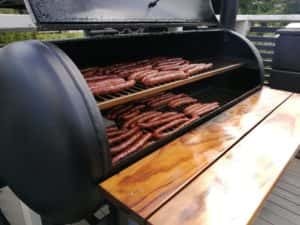 When sausages were done, we got to smoke them. First day ended late in the evening. Briskets, pulled pork and smoked sausages together with number of side dishes were served on long table where the whole team enjoyed their own cooking together. Second day started at 8:00am. Plan was simple. Tri-tip for the breakfast, burgers for lunch and ribs for dinner. 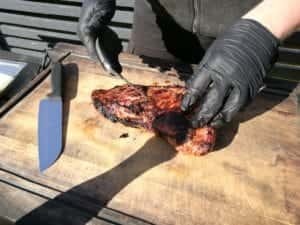 Tri-tip was made in reverse sear method. First we smoked it gently and then seared on hot charcoal grill. 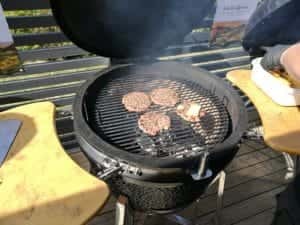 Burgers and ribs were familiar to me already as we cooked them also in last years’ camp. Sure I have done them at home many times also. Burger patties were minced from Black Angus chuck roll and pork ribs were two different kinds; spare ribs and baby back ribs. In addition we learned again how to prepare white fish and how to use kamado grill. My second JJ’s BBQ Camp met all expectations. Although many of the dishes we did were not new for me, most of the people were. In my opinion, BBQ is very much social happening. 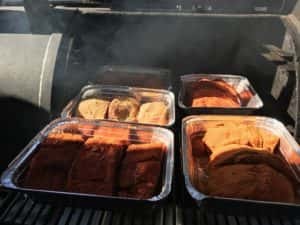 It was great to share experiences with other BBQ enthusiasts and enjoy two sunny days together. JJ was again great host and he shared some stories from his Texas road trip. I also learned he is writing a book about his journey. This I am looking forward to read. Most likely you will find review of the book here in my blog. Big thanks to JJ, Kalle Hämäläinen (co-chef), Feri and the whole team.